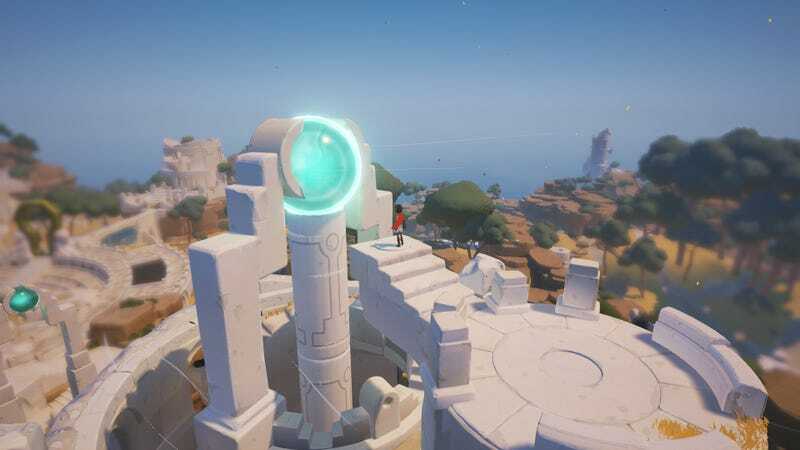 Look at a screenshot of Rime. Any screenshot. Take in the swirling colors, the vast oceanside vistas, the stark, mysterious ruins. It’s all distinctive, and yet somehow familiar. Rime wears its gaming influences on its sleeve, but it lacks their heart. Rime, an exploration-focused puzzle game that releases on PC and PlayStation 4 tomorrow, tries hard to conjure up a very particular sort of melancholy interspersed with moments of wide-eyed wonderment. You’ve got your sprawling, ruin-dotted nature-scapes on one side, your sparse piano that builds to semi-regular crescendos on the other, and a lone child character smack in the center of it all. You spend your time exploring (though ultimately being funneled through) semi-open locales and solving puzzles. There’s no violence. You can jump, roll, pick up objects, and sing (which usually activates things). The story is if anything perhaps a bit too minimal. Nobody talks, and you try to piece together what’s going on from environmental cues and the occasional cut scene. The influences here are clear: Ico, Journey, and Zelda, in that order. Heck, you even spend part of the game chasing down a character who looks almost exactly like the main character of Journey. It’s, uh, pretty on-the-nose. Games can still be great even when they’re derivative, and Rime does some things well. Thus far, I’ve haven’t encountered any puzzles that really challenged me, but a handful made me go, “Oh, that’s neat!” There’s a wide variety of them, too, and they encourage you to tease out answers by playing with objects that produce interesting, satisfying effects. I’m especially fond of puzzles that make use of light and shadow or night and day. For example, sometimes you have to roll these golden balls that control time itself, making the sun, moon, and stars scream through the sky at your command. Even if all you’re really doing is lining up some shadows to magically make a door unlock, the effect is awe-inspiring. That’s Rime’s greatest strength and weakness: it wants you to feel awe. So much awe. Just constant goddamn awe. It gets kinda cloying. I can’t count how many times I’ve solved an easy puzzle involving some basic platforming and maybe a block-pushing segment, only to be met with a dazzling light show, swelling orchestral music, and a dramatic camera zoom-out that reveals the massive structure around me. It’s like, for one, I didn’t even do anything that impressive, and for two, I get it: I already saw the structure while I was inside it for like 20 minutes. You don’t need to shove it in my face. Sometimes, a good puzzle and a cool environment work in tandem, and Rime nails it. There was a bit where I had to navigate a pitch-black cavern’s series of twisting pathways, which involved singing at statues to create light while subtly altering the game’s soundtrack. It was intimate and powerful. I wish the game was more adept at creating those sorts of moments. More often than not, though, it goes big and rings hollow, like a crappy pro wrestler trying to sell a whiffed dropkick. Rime feels desperate to create the sorts of iconic moments of the games that inspired it. After five hours (of about eight total, I’ve heard), I can count on one hand the number of times I’ve felt, well, anything. I’m all for games that don’t spoonfeed you exposition all the dang time, but the player still needs an anchor, something to keep them tethered as a procession of seemingly unconnected events leads them ever deeper into a dreamy haze. For the first few hours, I found only narrative breadcrumbs, and not enough to stop me from getting lost. By the time the game started to more concretely clue me in, I just didn’t care. I didn’t feel anything for the characters or the setting. Rime isn’t all bad, but mostly it just doesn’t bring anything particularly interesting or essential to the table. It wears the trappings of games like Journey and Ico without really understanding what made them so powerful. It sings the song at the top of its lungs, but if you listen close, you realize it barely knows the words.